Did you really think I'd let July 29 go by without a review of the most exciting fast food item to hit the market since something really exciting I can't think of right now? I sure didn't. I am horribly sick, and not just mentally. My whole body aches, I am in and out of fever — I should be resting and drinking plenty of fluids. Maybe nibbling a saltine. The only reason I remembered today was the day Popeyes was launching its new Chicken Waffle Tenders was because there's a location on the way to the drug store, where I was heading to buy $20 worth of stuff that would not work. I should have driven past. I did not. I had a duty to fulfill, and as long as my tastebuds were not compromised (they were fine) and I can eat without losing it on camera, it's a duty I will never shirk. A duty I will gladly shirk, however, is typing. Instead, here's my video review. I apologize for my face. The verdict? Juicy chicken cooked to perfection, coated in a gorgeously crispy and light batter with a hint of maple. 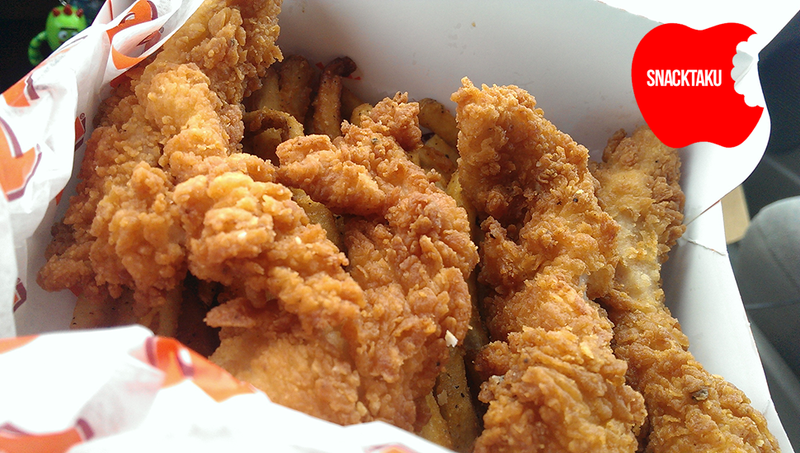 Combined with the honey maple dipping sauce, Popeyes Chicken Waffle Tenders are downright heavenly. I look forward to eating more later in the week, when my body isn't compelled to violently expel them two hours later (they still tasted good).